Popular solutions are superficial because they fail to see below the dashed line into the fundamental layer, where the complete causal chain runs to root causes. It's an easy trap to fall into because it intuitively seems that popular solutions like renewable energy, strong regulations, conservation, recycling and so forth should solve the sustainability problem. But they cannot, because they don't resolve the root causes. 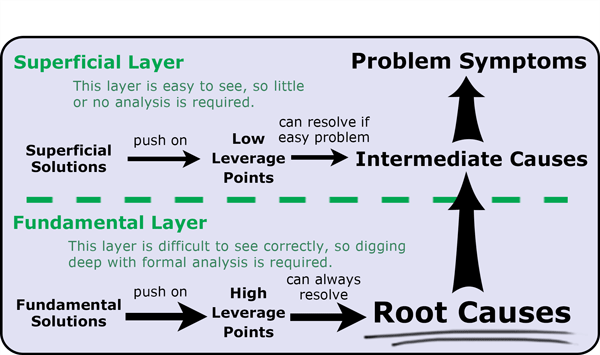 If you take an analytical approach, root cause analysis allows you to penetrate the fundamental layer to find the well hidden red arrow. Further analysis finds the blue arrow. Fundamental solution elements are then developed to create the green arrow which solves the problem. Click the image to see the causal chain links present in all problems. Click it again to hide the links. Each one of those links represents an entity in the real world that has a cause and effect. Something caused it to change. And once it changes, that has an effect on the next link in the chain. This is the classic systems thinking concept of cause and effect. Everything in a system is connected to one or more other things in a manner that results in astounding complexity and behavior. The fastest way to implement this principle is to develop the ability to see causal chains everywhere. 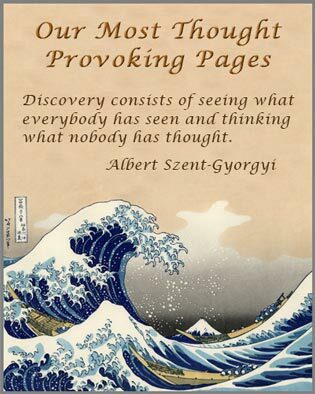 Everytime something interesting occurs, ask yourself: Why did that occur? What was the root cause? Follow the causal chain relentlessly until you get all the way to the root cause. It won't be long before you're asking the “What is the root cause?” question about the sustainability problem or whatever big problems you're working on. Strike at the root ! By extending a causal chain all the way to the solution of a problem, we arrive at a solution chain. A solution chain is the path of influence running from solutions to problem symptoms. In your analysis, first you find the causal chain of a problem. That gives you the root cause. Working backward from that, then you find the solution chain. How this works in our approach to problem solving is illustrated below. 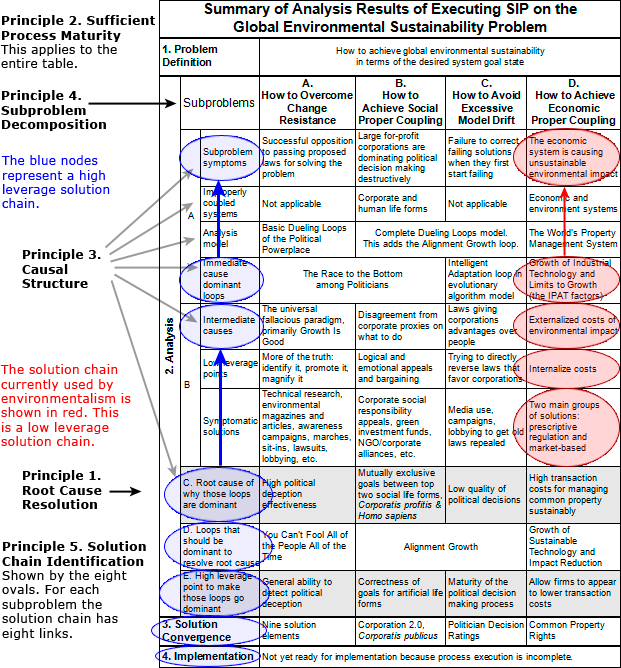 From the viewpoint of the System Improvement Process the upper four blue ovals are the causal chain for each subproblem. All eight ovals are the subproblem's solution chain. Solving the complete sustainability problem requires a high quality analysis and solution convergence effort that results in building four robust solution chains. The five principles are discussed in the glossary entry on the Scientific Method, in the section on An alternative paradigm that could possibly work. The concept of a causal chain lies at the heart of the poweful tool of root cause analysis. Once you start thinking in terms of causal chains, problems will look totally different. You will realize that most who have entered the fray are working on the superficial layer, because that's all they can see. But because you are thinking in causal chains, you can see both the superficial and fundamental layers. This forces your questions, probes, challenges, and conclusions to go much deeper, hopefully all the way down to the root causes. What makes complex systems really complex is their feedback loops. 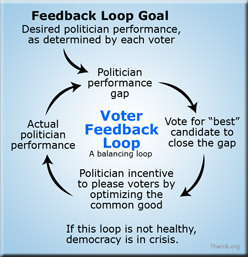 A system's most imporant causal chains run in circles, known as feedback loops.